A cleft is a gap or split in the upper lip and/or roof of the mouth (palate). It is present from birth. The gap is there because parts of the baby's face didn't join together properly during development in the womb. A cleft lip and palate is the most common facial birth defect in the UK, affecting around one in every 700 babies. What does a cleft lip and palate look like? Babies can be born with a cleft lip, a cleft palate, or both. A cleft lip may just affect one side of the lip or there may be two clefts. It can range from a small notch to a wide gap that reaches the nose. A cleft palate may just be an opening at the back of the mouth, or it may be a split in the palate that runs all the way to the front of the mouth. Sometimes it can be hidden by the lining of the roof of the mouth. The Cleft Lip and Palate Association has a photo gallery with pictures of cleft lips and palates before and after surgery. Cleft lips and cleft palates can sometimes cause a number of issues, particularly in the first few months, before surgery is carried out. Most of these problems will improve after surgery and with treatments such as speech and language therapy. A cleft lip or palate happens when the structures that form the upper lip or palate fail to join together when a baby is developing in the womb. The exact reason why this doesn't happen in some babies is often unclear. It's very unlikely to have been the result of anything you did or didn't do during pregnancy. In some cases, a cleft lip or palate can occur as part of a condition that causes a wider range of birth defects, such as 22q11 deletion syndrome (sometimes known as DiGeorge or velocardiofacial syndrome) and Pierre Robin sequence. Cleft lips are usually picked up during the mid-pregnancy anomaly scan carried out when you're between 18 and 21 weeks pregnant. Not all cleft lips will be obvious on this scan and it's very difficult to detect a cleft palate on a routine ultrasound scan. If a cleft lip or palate doesn't show up on the scan, it's normally picked up immediately after birth or during the newborn physical examination done within 72 hours of giving birth. When a cleft lip or palate is diagnosed, you'll be referred to a specialist NHS cleft team who will explain your child's condition, discuss the treatments they may need and answer any questions you have. You may also find it useful to contact a support group, such as the Cleft Lip and Palate Association, who can offer advice and put you in touch with parents in a similar situation. Cleft lips and cleft palates are treated at specialist NHS cleft centres. Your child will usually have a long-term care plan that outlines the treatments and assessments they're likely to need as they grow up. Read more about how cleft lip and palate is treated. The majority of children treated for cleft lip or palate grow up to have completely normal lives. Most affected children won't have any other serious medical problems and treatment can normally improve the appearance of the face and resolve issues such as feeding and speech problems. Surgery to repair the cleft may leave a small pink scar above the lips. This will fade over time and become less noticeable as your child gets older. Some adults who've had a cleft lip or palate repair may be self-conscious or unhappy about their appearance. Your GP may refer you back to an NHS cleft centre for further treatment and support if there are any ongoing issues. Will a cleft lip and palate happen again? Most cleft lips and palates are a one-off and it's unlikely you'll have another child with the condition. The risk of having a child with a cleft lip or palate is slightly increased if you've had a child with the condition before, but the chances of this happening are thought to be around 2-8%. 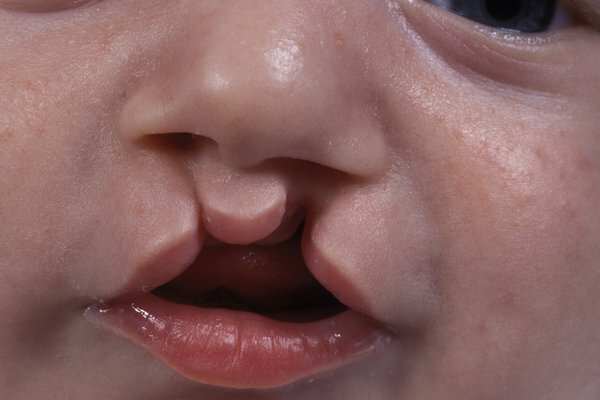 If either you or your partner were born with a cleft, your chance of having a baby with a cleft is also around 2-8%. Most children of parents who had a cleft will not be born with a cleft. The chances of another child being born with a cleft or of a parent passing the condition to their child can be higher in cases related to genetic conditions. For example, a parent with 22q11 deletion syndrome (DiGeorge syndrome) has a 50% chance of passing the condition to their child. If your child has a cleft lip or palate, your clinical team will pass information about him or her on to the National Congenital Anomaly and Rare Diseases Registration Service (NCARDRS).